At the end of Spring Break, I was wondering what to read to the kids the first day back to school. As I was changing my big books, I came upon Rosie's Walk. Haven't "done" Rosie's Walk for a few years. We are still a little anti-fox since the episode with the gingerbread man, so it would be fun to see karma deal with him. We would read, reread, act out and retell Rosie for a few days. 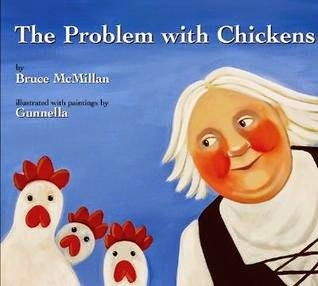 Well, it seems as if you can't read just one chicken story. 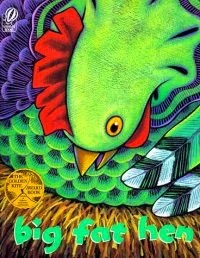 This classic follows two stories - the chicken's walk, told with text, and the fox's walk, only told through illustration. Rosie gets home in time for dinner, rather than being the fox's dinner. A great story for retelling, acting out, and using as a frame for creating new stories. 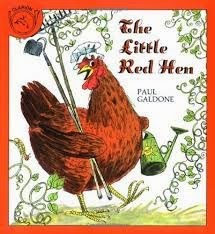 The Little Red Hen plants seeds and tends her garden, harvests and mills her grain, and bakes a cake while the the Dog, Cat and Mouse laze about. When the Little Red Hen is ready to eat the cake, she no longer needs any help. She is able to manage all by herself. But the next time she is needing help watering and weeding, it seems as if the Dog, Cat and Mouse are more willing to lend a hand. Chicken Little is bonked on the tail by an acorn. Convinced that the sky is falling, he gathers his friends to go and tell the king. Luckily the king has a larger world view than Chicken Little. The is the version that I purchased from Scholastic books sometime in the last 20 years. There are other versions that look intriguing: one written by Rebecca Emberly and illustrated by Ed Emberly, and another written and illustrated by Steven Kellogg. And then there is the movie. 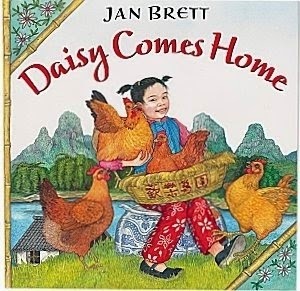 Jan Brett bends her amazing art and story telling skills towards poultry. Poor Daisy is an unhappy, picked (and pecked) on Chinese chicken. One night she decides to sleep in a basket down by the river rather than endure the taunts of her chicken coop room mates. She wakes up floating in her basket down stream, and has adventures with water buffalo, monkeys, dogs, cormorants and a fisherman who tries to sell her at the market. These adventures teach Daisy how to assert her rights to a spot on the perch in the chicken coop. Papa is trying to read a bedtime story to Chicken. But Chicken keeps interrupting and making it impossible for Papa to finish the story. Trying to read to Chicken must be very exhausting, because before the end of the story, Papa is snoring away and Chicken is reading him a story. 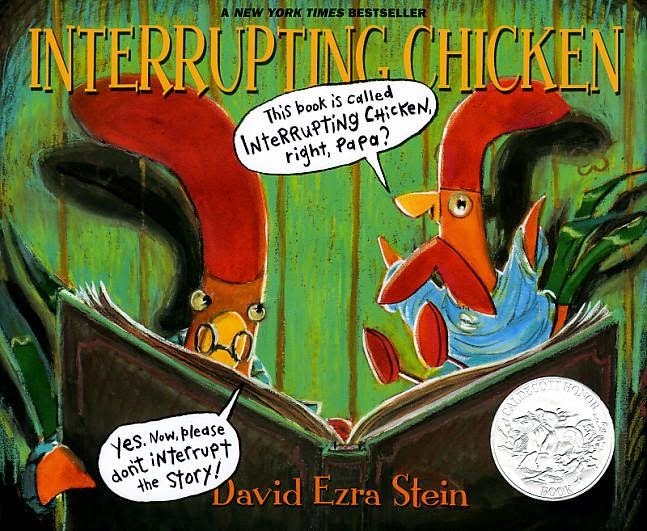 A great book for reminding children about interrupting other - the refrain "don't be an Interrupting Chicken" is common in our classroom. A group of rural Icelandic women have a problem: they need eggs but cannot get the wild bird eggs from the cliffs. So they buy some chickens. But the chickens think they are ladies, not chickens, and are too busy picking blueberries, going to birthday parties and singing to sheep to lay eggs. The ladies come up with a plan. They start exercising and the chickens copy them. Soon the chickens are strong enough to fly away, build nests and lay eggs. And the women are strong enough to get the eggs from the cliffs. Gunnella's folk illustrations are completely engaging for both adult and child. 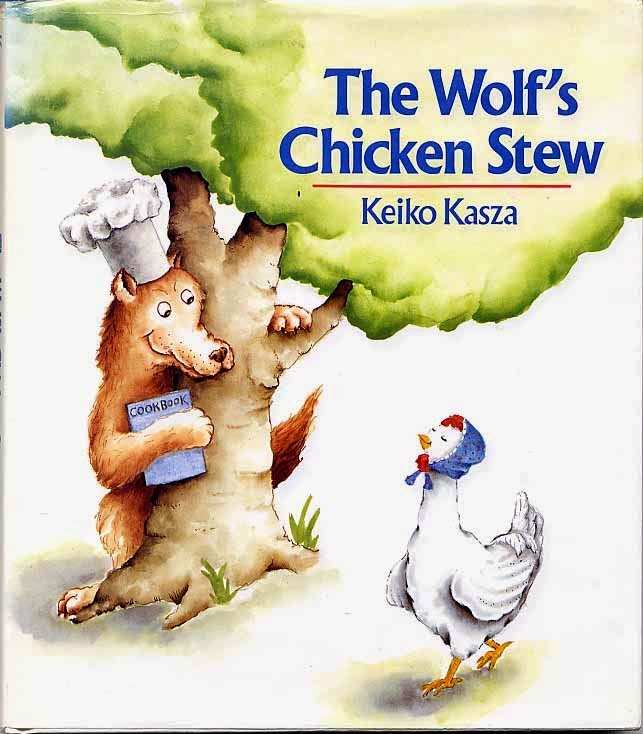 A hungry wolf sees a chicken who would make a lovely dinner. But being a wolf with excellent self regulation, he decides that feeding the chicken and fattening her up would result in a tastier feast. The crafty and patient wolf brings the chicken fattening yummies - doughnuts, pancakes and cake. Just as he is about to claim his prey, Mrs Chicken invites him into the henhouse so that all the little chicks can thank "Uncle Wolf" for all the treats that he has been leaving for them. Rather than leaving with supper in his belly, Uncle Wolf leaves the henhouse with plans for whipping up a batch of chocolate chip cookies for all his little nieces and nephews. Another good story for telling and retelling. 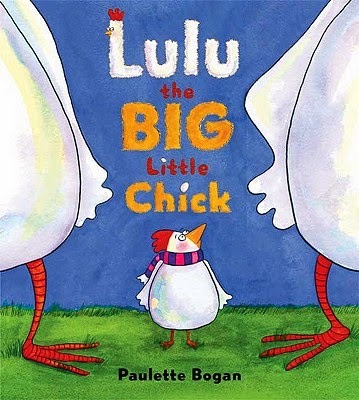 Lulu decides that she wants to go far, far away, where no one tells her what to do, or that she is too small. Luckily, when she manages to get far, far away, and far too close to a crow, Mama manages to be close by. Lulu decides that next time she wants to go far, far away, Mama will be a good travelling companion. My students "got" Lulu's way of thinking. The iconic counting nursery rhyme (one, two, buckle my shoe ...) with bright, bold acrylic illustrations containing lots of things to count. A frog brings a perfectly round pebble that he has found to show his two friends. One of the friends, who knows a lot about everything, knows that it is a chicken egg. When the egg hatches, out crawls a chicken, a green, scaly chicken who is an amazing swimmer. 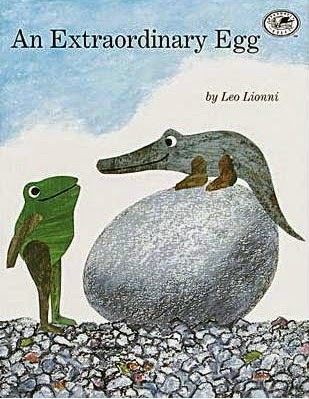 When the chicken and its mother are reunited, the frogs find it surprising, and most unusual, that she calls him her little alligator. My students find it hilarious. We couldn't leave the chicken experience to just reading about chickens. We extended an invitation to chicken visitors. This delightful silkie, Woodchip, visited with her camera shy friend, Pepper. 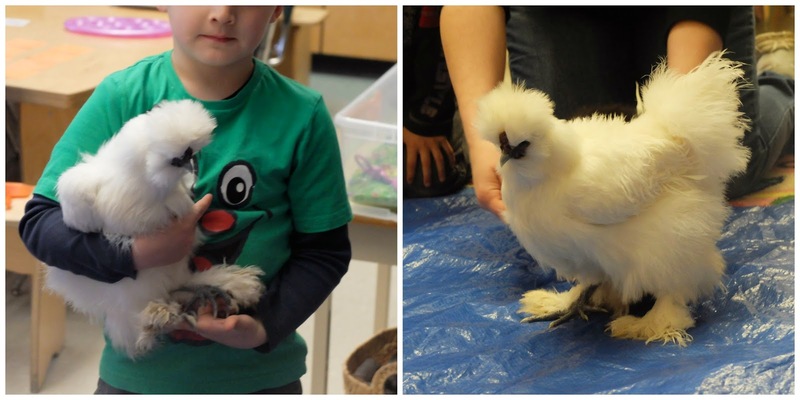 A couple of chickens in the classroom tends to liven things up a bit. 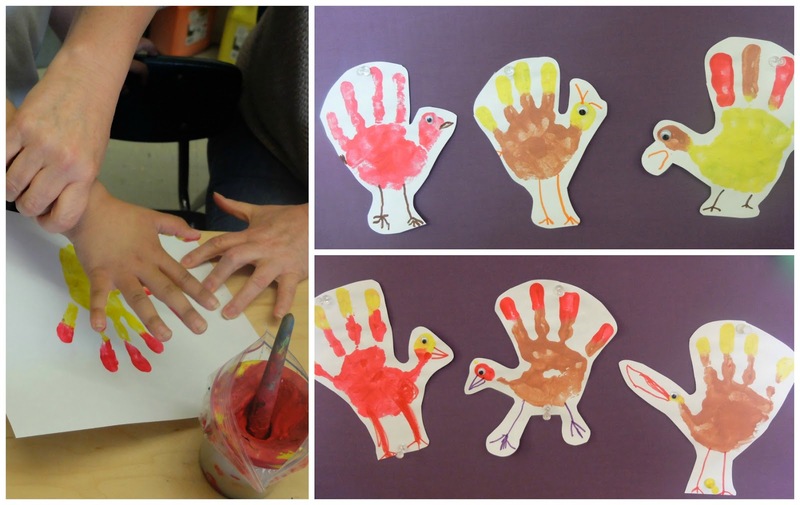 We painted up our hands to look like chickens - strutting across the yard, clucking to the sky, thinking about life, and even dancing. We've been dancing like chickens. If you need a little light relief, dance the Chicken dance with a kindergarten class. It is seriously impossible to get through a song without laughing. 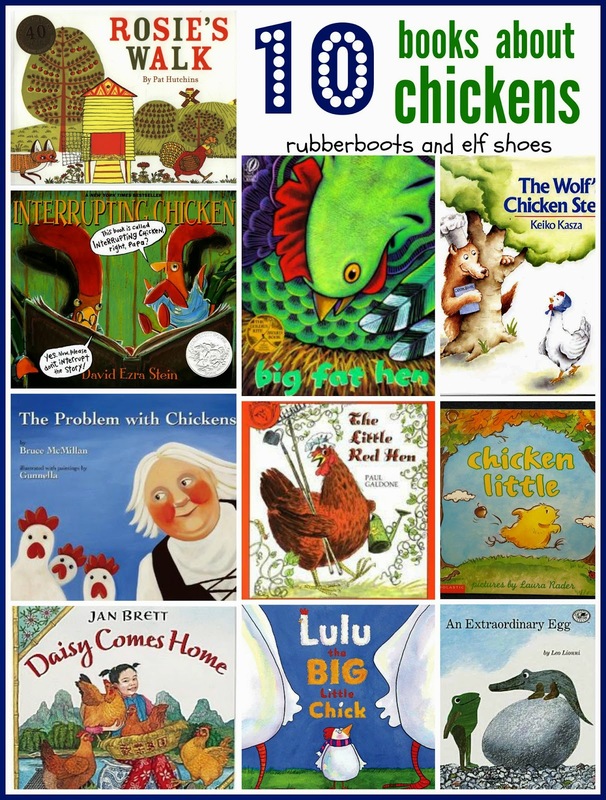 What chicken books do we need to add to our reading list? My Rosie book has been sitting on my desk since December. I love that book but, like you, haven't read it in a few years. What's with that? Love all your chicken choices. It's funny, isn't it. Rosie's Walk is such a good book -and there are so many possible activities to do with it. Do you have the McCracken pocket chart pictures? 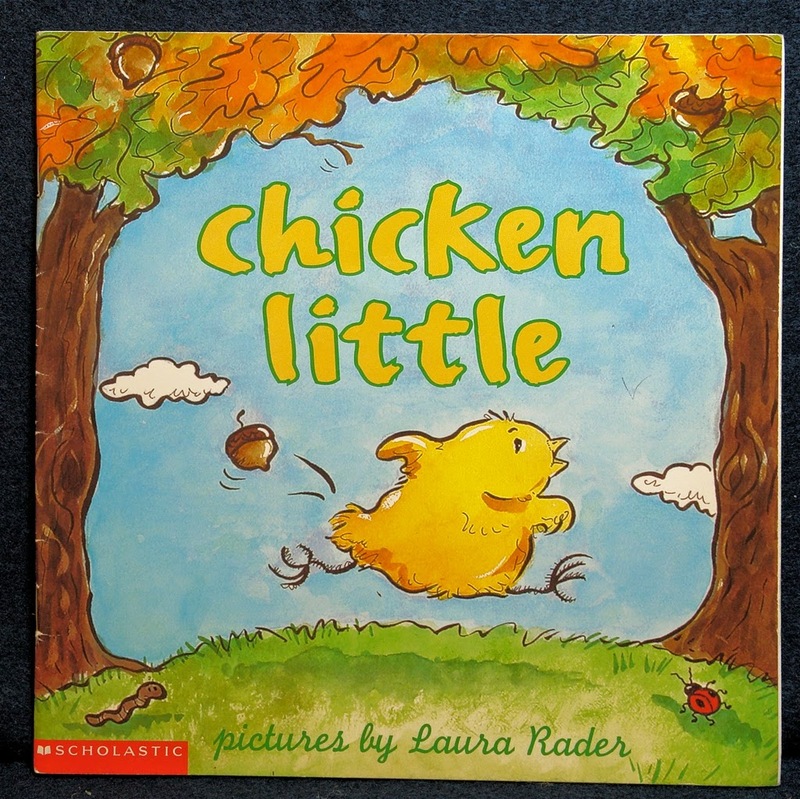 I love chicken books!! You have a good list there. Some I haven't seen, so I'll have to check them out. I would add -- Minerva Louise by Janet Morgan Stoeke and Lottie's New Beach Towel by Petra Mathers and there is a new one out called Henny by Elizabeth Rose Stanton about a chicken with arms! Thanks for the book suggestions. Off to the library I go!